Papillion, NB – The Nashville Sounds made history Wednesday night by no-hitting the Omaha Storm Chasers. A combined effort from Chris Smith, Sean Doolittle, Tucker Healy, and Simon Castro got the job done for the Sounds in their 4-0 victory. It was the seventh no-hitter thrown in club history and first since Manny Parra’s perfect game in 2007. Smith, the Sounds starter, cruised through the first six innings, allowing just two base runners via base on balls. He then handed the ball off to Doolittle who is with the club on a Major League rehab assignment. Doolittle needed just 12 pitches to retire the three Storm Chasers he faced including two punch outs. Healy came on in the eighth inning and sat the three Omaha hitters he saw down in order on a mere nine pitches. 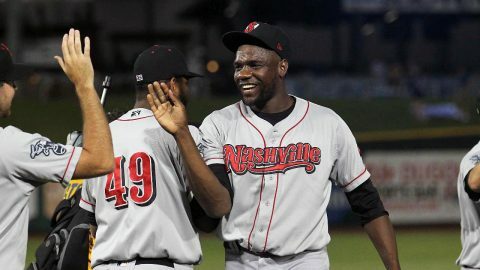 In the ninth inning, Castro took the bump and allowed a one out walk but induced ground outs from the final two batters he faced to complete the historic night for Nashville. The Sounds continued to use the long ball to spur their offense. In the second inning Matt McBride took Omaha starter, Christian Binford, deep for a two-run shot to give the Sounds a 2-0 advantage. The very next inning Nashville left the yard once again. This time it was Renato Nunez’s turn. The Sounds slugger cranked his team-leading 16th home run of the season to extend the lead to 3-0. Ryan LaMarre provided Sounds fans with a free frosty from Wendy’s by driving in their fourth run of the game when he did so in the top of the fourth inning. It was the 18th run driven in on the season for LaMarre. Wednesday night was the first time the Storm Chasers had been no-hit since June 29th, 2008. The 4-0 victory was the seventh shutout for the Sounds pitching staff in 2017. With two more home runs Wednesday night, the Sounds have now clubbed a Pacific Coast League leading 78 on the season. They are 18-7 when belting multiple home runs in a game this year. The final game of the four-game series is set for Thursday night at Werner Park. Right-hander Corey Walter (1-1, 4.60) starts for Nashville against right-hander Luke Farrell (5-2, 4.61) for Omaha. First pitch is scheduled for 7:05pm.